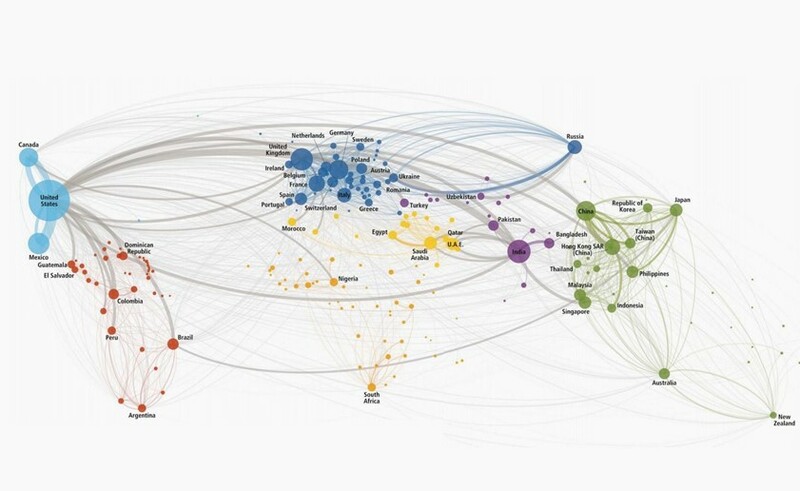 The map above depicts the volume of phone calls between countries. The average international phone call travels over 4,000 km. The average person spends 152 minutes a year talking to somebody in a foreign country – up from 88 minutes in 2005. 7.7% of all international phone calls are from the US to Mexico and 3.2% are from the US to India. 41% of all calls go from developed countries to developing ones while just 9% go the other way. Read more about popular non-US telephone connections, why this shows that the earth isn’t flat, and see an alternative depiction of the data above here.